There are a plethora of raclettes to choose from. In this section, we will review some of the currently available raclettes on the market and explore why different types of raclette may suit different circumstances. Raclettes need some kind of heat source, be that electrical or chemical, space to melt cheese/warm sauces and a cooking surface. With that basic criteria in mind, my first recommendation is the Andrew James Traditional Raclette. It has a medium size cooking area (30cm x 42cm) which is more than enough to cook for between 2 and 4 people and part of the cooking surface is flat to allow for crepes/fajitas to be cooked. This was the first raclette I bought and as a result of the many great summer evenings I spent using it, I have bought bigger and better raclettes. This raclette is great value for money and ideal if you want to try out ‘racletting’ without much of a financial commitment. To truly get the full ‘raclette’ experience, you need to be cooking on a stone surface. This is because stone, such as granite, gets to a temperature that can truly allow you to ‘sear’ meat, thus locking in the moisture and thus the flavour. I have found a noticeable difference in the tenderness of steaks cooked on the traditional raclette above and stone-surfaced raclettes. So with this in mind, my next recommendation is the Andrew James Rustic Stone Raclette. The raclettes above are ideal for 2 to 4 persons. So what happens when you want more of a party feel? There are bigger, more versatile raclettes available. As you would expect, the cost increases with the size. My next recommendation is the Severin Raclette Party Grill. 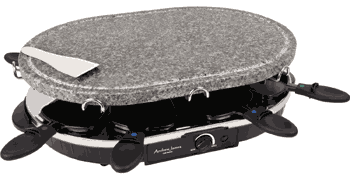 This raclette features two cooking surfaces. One is a standard stone surface, whilst the other half is a two-in-one. On one side, it is a griddle pan for cooking meat, fish and so on. On the other, you have a handy mini-crepe pan. The cooking surface is 49cm by 25cm, so more than enough room for multiple guests. It is both easy to assemble and easy to clean. Once you have mastered using a raclette, you may want to think about bigger surfaces for more people, deeper pans for more flexibility, and even other features such as integral fondue attachments. There a two or three advanced-level raclettes on the market, but my recommendation (and my personal current model) is the vonshef 12 person Raclettte Grill with 6 Fork Fondue Set. This model has a cooking area that can cater for up to 12 guests and comes with 12 pans. 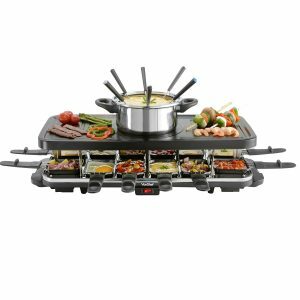 Unlike other Raclette grills this model combines a grill and fondue set, getting the best of both of these dinner party experiences. the fondue pan replaces the grill and can then be used for chocolate, oil, stock or cheese fondues. This is a raclette that really does have everything and I cannot recommend it enough.